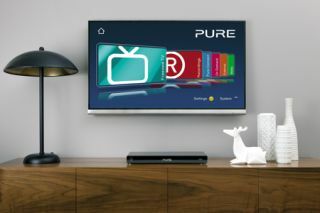 Pure launches Avalon 300R Connect Freeview+ HD set-top box | What Hi-Fi? Pure Digital, best known for its digital radios and music streaming systems, is expanding into the set-top box market. It is launching the Pure Avalon 300R Connect Freeview+ HD digital TV recorder, available in 500GB and 1TB versions for £300 and £350 respectively. The box delivers free access to four HD channels from the BBC, ITV and Channel 4, plus 50 SD channels. Users can also pause and rewind live TV for up to two hours. If you go for the 1TB version, you'll be able to record up to 250 hours of high-definition or 600 hours of standard-definiton material. There are dual Freeview tuners, an 8-day electronic programme guide (EPG) powered by Imagination Technologies' PowerVR graphics, integrated wi-fi, USB slots on the front and back, plus four HDMI inputs round the back allowing you to switch between other connected devices using the Avalon box. On-demand web services such as BBC iPlayer, YouTube and Pure Connect are available, and video or audio content can be streamed to the Avalon via a network storage device or a uPnP device. Pure Connect is the new name for the Pure Lounge, which allows you to access a world of live radio, on-demand content (podcasts, listen again programmes and ambient sounds) and thousands of online radio stations. The Pure Connect service will feature on Contour, Avanti Flow, Sirocco 550, Oasis Flow and Sensia products. As for audio, the Avalon 300R supports Dolby Digital Plus, providing up to 7.1 channels of audio from supported Freeview, USB or networked content. In the coming months, Pure will also add additional on-demand capabilities including access to Pure Music, its own music subscription service; compatibility with Pure Stream, so owners can wirelessly stream music from iOS or Android devices to the Avalon; and the ability to record SD programmes to a USB stick for playback on other devices such as a PC or laptop. The Pure Avalon 300R Connect will be available in the UK from October.